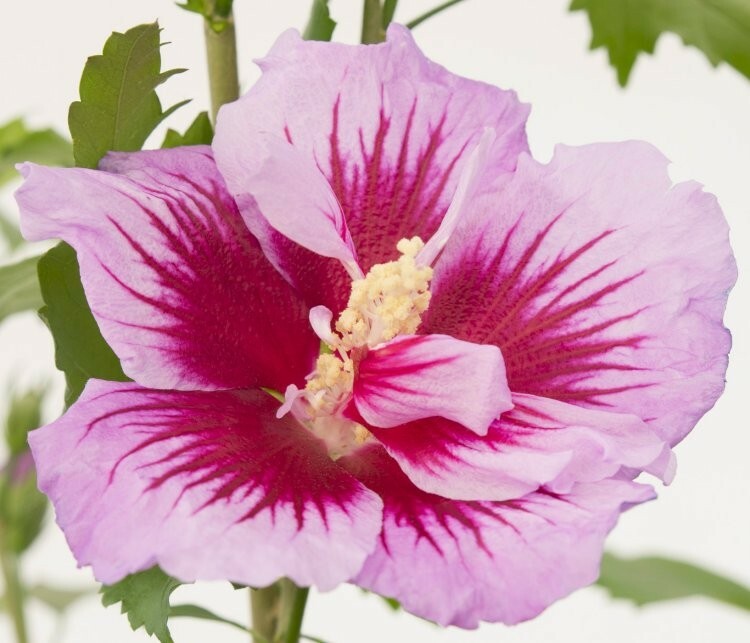 Hibiscus Purple Pillar is a fabulous new specimen in the Hibiscus family with an outstanding natural pillar shape and gorgeous semi-double flowers. Purple Pillar provides beautiful purple-violet flowers, shaded deep red in the centre right from the bottom of the tall plants to the very top. It will reach a height of up to 3-5metres if left un-pruned with a width of just 1m. This makes it the perfect plant if you're looking for something with a columnar effect, plus with the bonus of flowers. It can even be used to create a fantastic floral hedge if you plant several. There is quite a store to Purple Pillar, originally, this new variety came from a nursery in Spain. Andres Santiago worked at that Spanish nursery and discovered the plant among a batch of Hibiscus seedlings, selecting it due to it's different flower colour and more double flowered blooms initially. Even more special was the upright, pillar-like habit he spotted. He started to propagate it by cuttings, and after a couple of years it became clear that this Hibiscus could be grown as a very special, slim tree blooming continuously from late July until November. The nursery in Spain went into bankruptcy. However Santiagos friend in Italy, Francesco Gandini had already acquired some of these particular seedlings. 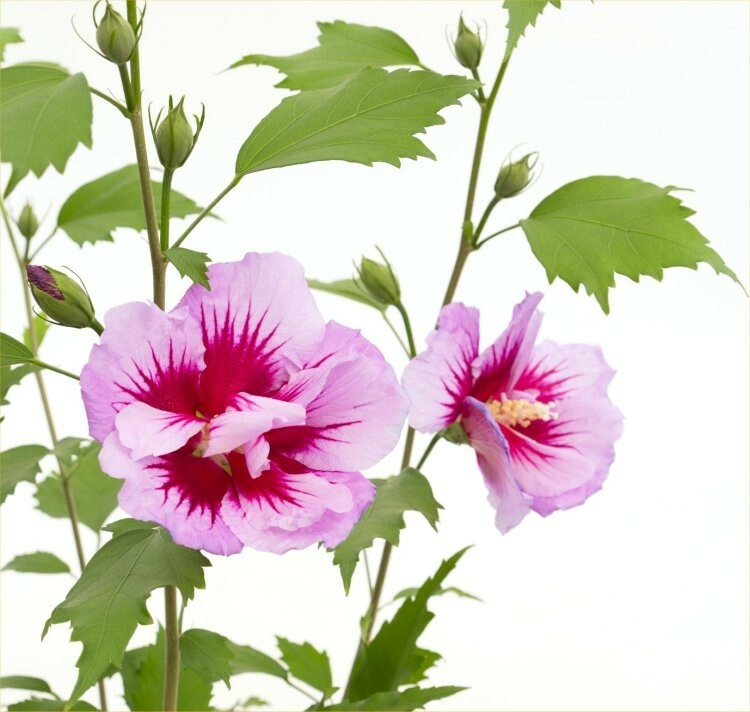 He saw possibilities for these plants as rootstocks for other Hibiscus species. Due to the rapid growth the straight upright growing these seedlings are perfect for grafting. During a visit of nurserymen from the Netherlands to Francesco Gandinis nursery they saw the first plant which Santiago had given to his Italian friend. The special shape of the plant impressed them. But they were very surprised when Gandini told them what he used the plants for. They saw great potentials for the pillar-like Hibiscus syriacus as an ornamental tree and ask Gandini permission to test the tree in the Netherlands. The outcome of these tests was very promising. The plants grew indeed fast and upright. They also showed to be winter hardy. In consultation with Santiago and Gandini the Dutch growers applied for European Plant Breeders Rights and Purple Pillar was officially born, so to speak. The name which is chosen for this tree of course refers to the colour of the flowers and to the growth habit. There is also a white version of Hibiscus Purple Pillar in the pipeline. Supplied in approx. 1-2 litre containers, full of buds and flowers in season.